Finally! 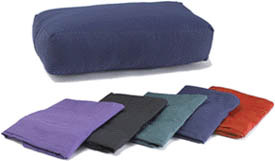 Yoga Accessories customers can purchase just the cover for our best selling Supportive Rectangular Yoga Bolster. Now you can reinvigorate your existing bolster with a fresh face! A new cover is a great way to increase bolster life span or accommodate a change in studio color schemes. Each cover is just like the original: 100% cotton with handles on both ends, the same great color options, and features a full-length zipper so the cover can be easily replaced. These bolster covers are top quality and were exactly what I was looking for. The bolsters in my studio are used so often and I had them for so long that they faded a bit. Ordered these covers and they are bright, colorful and easy to slip on. Thanks Yoga Accessories!